THIS IS THE WAY THE WORLD ENDS. AGAIN. Three terrible things happen in a single day. Essun, masquerading as an ordinary schoolteacher in a quiet small town, comes home to find that her husband has brutally murdered their son and kidnapped their daughter. Mighty Sanze, the empire whose innovations have been civilization's bedrock for a thousand years, collapses as its greatest city is destroyed by a madman's vengeance. And worst of all, across the heartland of the world's sole continent, a great red rift has been been torn which spews ash enough to darken the sky for years. Or centuries. But this is the Stillness, a land long familiar with struggle, and where orogenes -- those who wield the power of the earth as a weapon -- are feared far more than the long cold night. Essun has remembered herself, and she will have her daughter back. She does not care if the world falls apart around her. Essun will break it herself, if she must, to save her daughter. 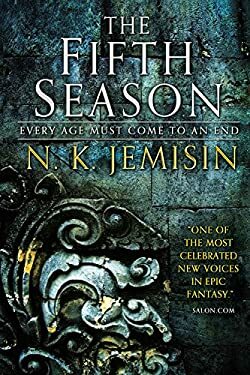 The first novel in a new series by award winning author N. K. Jemisin where a mother struggles to find her daughter in a post-apocalpytic world. New (662 available) BRAND NEW. Over 1.5 million happy customers. 100% money-back guarantee. Make your purchase count: support Better World Books' worldwide literacy partners.